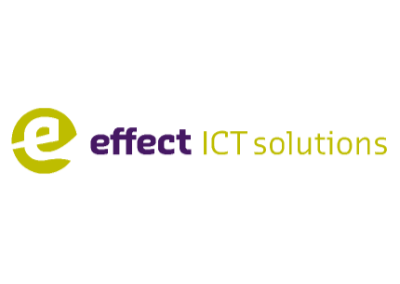 Effect ICT Solutions specialises in ICT solutions for SMBs. Our goal is to ensure that you as an entrepreneur work effectively and efficiently with computerised office systems that meet all your wishes and requirements. We do not focus on products and services, but on your interests as our client. This way, we enable you to work with the best and most future-proof solutions within your organisation. But the best solution for your office environment could well be in the ‘cloud’. Not only do we specialise in traditional office automation, but we are also experts in ‘cloud’ related solutions. Naturally we will advise you on the most effective cloud solution for your organisation. Effect ICT Solutions is an open and transparent company with enthusiastic and expert staff who’ll go the extra mile to make sure you are satisfied. We are keen to develop a longer-term relationship with our clients, as only then can we talk about a truly effective partnership. The personal touch and close involvement are both concepts that are written into our DNA. Naturally you expect us to be market leaders in the application of innovative solutions, and that we are intimately familiar with the latest technologies. Expensive? No, not really, in fact we’d dare to say that your costs will be lower over the longer term. After all, our highly qualified personnel will always provide you with a professional, appropriate and clearly priced solution that grows together with your business. And that means you know exactly where you stand – there are no hidden costs.